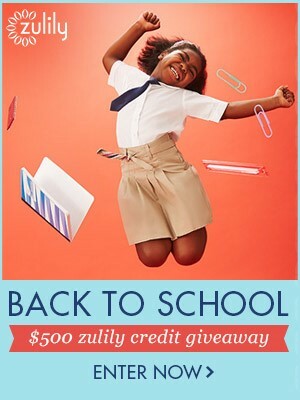 Zulily Back to School Giveaway! Ok y’all, I need to make a confession. I’ve been spending way too much time on Zulily lately! With all the time spent nursing Hadley when I run out of Instagram to check and Tweets to read I inevitably find myself on Zulily. Case in point, I’m done with Christmas shopping for Hadley and getting close for Charlotte and James! Then come back here and post a link to the item in a comment on this blog post. By posting a comment with a link to your favorite item, you will be entered to win $500 to Zulily. On August 12th, Zulily will announce which blog writer won their contest. If I win, then I’ll use a random number picker to choose from my entrants and will announce who won on August 13th! To show you some of what Zulily has to offer right now, here are some of my favorite back to school items! Here’s hoping that we both win! Happy Shopping! Please view my link/review disclosures for more information on my affiliate links. All opinions are totally my own! I only share items with you that I truthfully love and use! I like pretty much everything in this line!